A guide to the best titles to buy for the instructions you want! Books are a great way to learn to crochet or to learn new techniques, as well as to have a ready reference source of answers to crochet questions. Pattern books can be a great source of enjoyment in browsing and in crocheting new patterns you haven't tried before. Browsing through the listings below may be helpful to you in making a choice of books that you would enjoy owning in your home library. Someone who has never crocheted before can learn how to crochet from a good reference book that contains easy to follow instructions and clear diagrams. After teaching the very first slip knot, these books will continue with basic stitches and move on to exciting and interesting pattern stitches that a new crocheter can learn when ready. In these versatile books, experienced crocheters will find tips and techniques for their skill levels, as well. Crocheter's Skill-Building Workshop by Dora Ohrenstein. This is the best all-around guide to basic and advanced stitches for people working at any level of the craft. 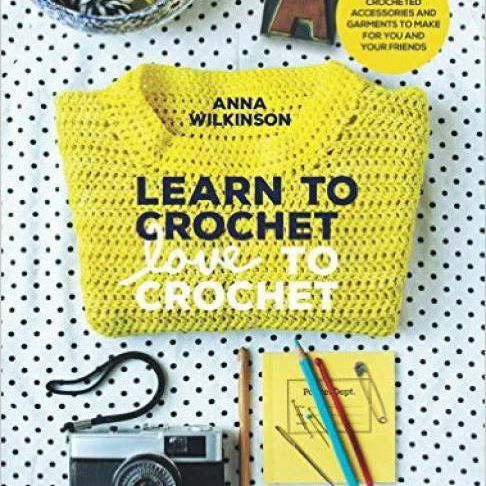 Learn to Crochet, Love to Crochet by Anna Wilkinson. This crochet book features 20 beginner patterns for clothing and accessories. Hooked on Crochet by Ruth Maddock. This is a very simple straightforward learn-to-crochet book. Crochet Your Way by Gloria Tracy and Susan Levin. This book has color illustrations for learning the basics, including diagrams for left-handed crocheters. The 40+ patterns in this book also include a learn-to-crochet afghan and patterns for hats and sweaters. These patterns are written in text along with symbols charts and the book includes answers to many beginners questions. Crocheting in Plain English by Maggie Righetti. This book has black and white illustrations for learning the basics, patterns that are learning lessons, patterns for plain and fancy stitches, edgings and motifs. It also has comprehensive chapters of answers to beginner questions. How to Crochet: The Definitive Crochet Course by Pauline Turner. This is a series of 10 workshops with step-by-step techniques, stitch libraries and projects. The Harmony Guides: 300 Crochet Stitches. This is a wonderful resource for learning more pattern stitches and techniques. It includes patterns with color photos for motifs, filet crochet, lace, shells, clusters and bobbles, with instructions both in written form and in diagrams. The Harmony Guides: 220 More Crochet Stitches. This is another resource for learning even more pattern stitches and techniques. It includes color photos for Irish crochet, edgings, motifs and all-over patterns, with instructions both in written form and in diagrams. It is fun to crochet for children of all ages, whether they are your own kids, people you know or gifts for charity. These crochet books are the best for people who want to make items for kids. Adorable Crochet for Babies and Toddlers. This book has 22 projects to make for babies from birth to two years. Baby Shoes to Crochet: Grown-up Styles for Little Feet. This is an adorable collection of baby shoe crochet patterns. Candy Blankies. This book has 30 projects of cuddly crochet for babies and toddlers. Candy Tots: Unique Crochet for Babies and Toddlers. This book has more than 30 crochet garment patterns including a granny square hooded coat, a festive crochet poncho, and a pullover. Cozy Toes for Baby. This book has a terrific selection of crocheted baby shoe patterns. Crochet For Babies and Toddlers. This book has more than 20 crochet patterns, fitting infants to three-year-olds, for baby outfits, hats, stuffed toys and more. The instructions include a pattern outline and dimensions for each design. Crochet For Kids. There are more than 30 unique and fun designs here for babies, toddlers and preteens. Simple Crochet For Cherished Babies. Suitable for beginners, this book includes a basics section and 28 crochet patterns. Too Cute Crochet For Babies & Toddlers. This is a whimsical collection of crochet hats, scarves, mittens and booties. Granny Squares Nanny Squares Crochet Book. The ten books that you will find listed at this link are all books filled with granny square crochet projects. There are classic granny squares, variations on the granny squares and projects for using crochet granny squares. This traditional motif can be used in so many different ways! The Granny Square Book by Margaret Hubert. Some of the best books in the "granny square" section are by Margaret Hubert who has created beautiful variations on this motif. However, that's not all that she crochets. She is the other of more than one dozen crochet books. She excels at both instructions and creativity and provides a great place to start when you're looking for a new crochet book to inspire you. A majority of crochet pattern books have less than twenty patterns in them. That's okay, especially when they are carefully curated to a niche theme. However, if you want to get more bang for your buck, you'll enjoy the following crochet titles that have at least 70 patterns in each book. Crocheted Gifts in a Weekend: 70 Quick and Lively Projects to Make. This collection of 70+ patterns is filled with instant gratification projects. 101 Fun to Crochet Projects by House of White Birches. The projects in this book range from tiny to large. 99 Little Doilies. This ultimate collection of miniature doily patterns includes close-up photos and clear instructions. 101 Crocheted Doilies by Dover Publications. This book contains the following sections: Crocheting Doilies, Floral Doilies for Crocheting and Crocheting Ruffled Doilies. 101 Easy Scrap Crochet Projects. This books offers many ideas for using up leftover yarn. It includes patterns for toys, home decor items and wearables. Edie Eckman's 2014 Christmas Crochet Book. This selection of ten books will be all that you need to make everything you want to make for Christmas each year. Whether its decor for your home or gifts for everyone you know, these titles cover it all. 1930s vintage knitting and crochet pattern book. The seven titles that were rounded up in this collection are the best of the best when it comes to vintage titles that still offer something new to the contemporary crafter. Find these books online or in used bookstores and you'll be thrilled to uncover the gems in the pages. You might also be interested in these ten 1930's crochet books. This final list includes more than twenty different titles that are about crochet and intended for people who love the craft but aren't instructions or patterns. These are fiction stories and non-fiction essays and research about crochet, books that you can curl up with at night beneath one of your own crocheted afghans and read well into the wee hours.